And now with my forced relaxation (? Is that an oxymoron?) with my writing, what am I to do? Usually, when I have a few days of down-time, I end up running a cat or two to the vet (fingers crossed that will not be the case! ), nap a bit because I am exhausted, feel guilty about not getting more writing done, read books about self-publishing, run errands, do chores… You get the idea. I don’t actually have a lot of time where I am unencumbered by obligations. Most people don’t, and I find this sad. 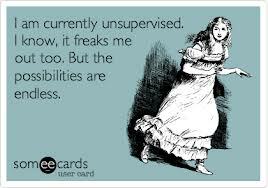 I think we need time that is completely unstructured and unsupervised. We need to be untethered from our planners and our appointments and our household chores. We need to be able to say no to obligations and a time clock. I am facing four days with nothing on my schedule except a much-needed and well-earned massage Friday morning. 🙂 That and a bottle of two of wine chilling is about all my mind is capable of taking in at this point. I think I may see if I still remember how to lay around immersed in a fat, well-populated work of fiction. I may be ambitious enough to pull out that violin and make some noise. What would you do if you suddenly found yourself with that rare gift of free time? Hi Dianne! It took a massage, a long nap and a bottle of wine to get me to relaxed Friday night, but I was able to maintain that lovely state of mind throughout my time off. 🙂 I highly recommend the massage!